A high plume fans, designed for safer and more reliable displacement of lab exhaust air. This schematic represents a typical lab exhaust system. Included are the lab hoods, modulating control valves, ductwork connecting to a manifold, a mixing box with bypass damper, a QMX mixed flow fan and a Vari-Plume high plume dilution nozzle. While this illustration shows a single fan/multiple hood arrangement, the Vari-Plume is also available for other lab exhaust configurations. From a one fan/one hood system to more critical redundant system configurations, Vari-Plume is your answer for laboratory exhaust. Multiple fan system options for both the QMX and CA are available. The Power-Plume was designed for critical lab applications where safety and efficiency are the primary concerns. Power-Plume is a powered induction device used to induce large amounts of ambient air and generate plume height regardless of the lab exhaust flow. 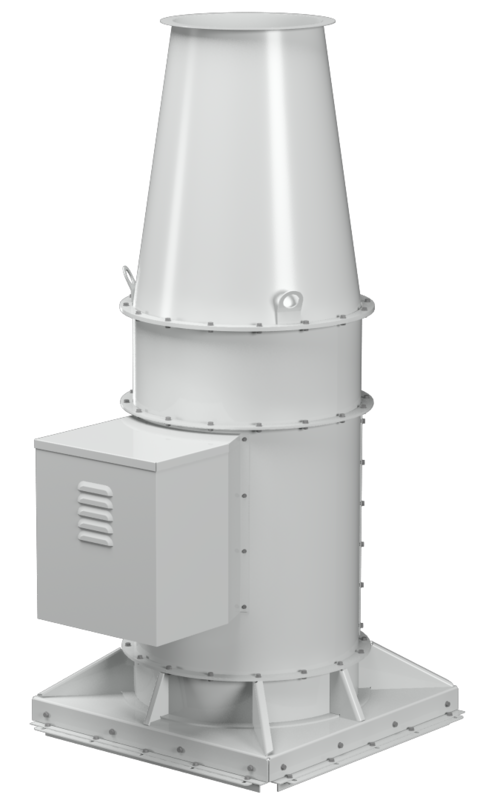 This device has the unique advantage of maintaining a minimum 50 foot plume height even as the lab exhaust flow is reduced for partial load conditions. Dilution rates at maximum lab exhaust flow exceed 200%. As the lab exhaust is reduced, dilution rates can exceed 1,000%. 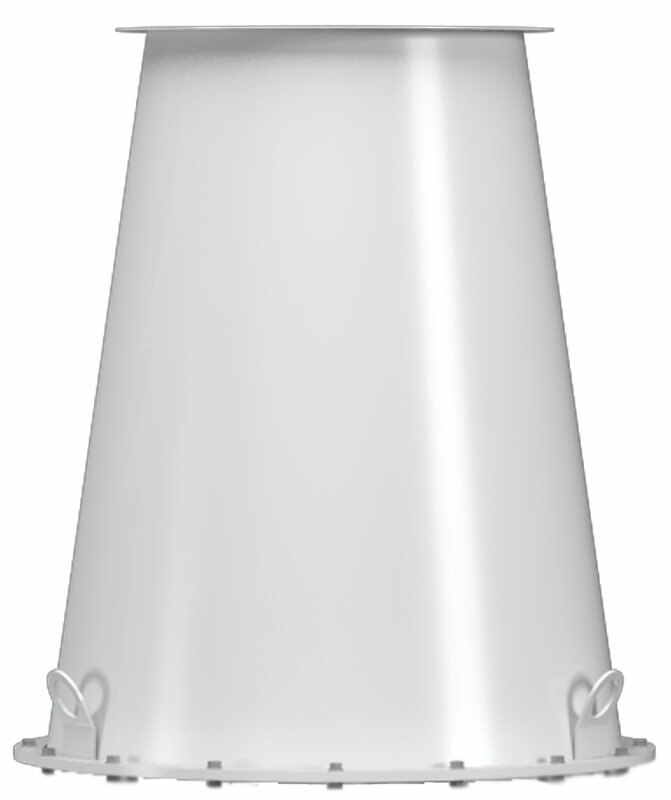 Power-Plume conveys a column of ambient air around the lab exhaust air encapsulating the contaminated lab exhaust. The primary lab exhaust fan is still utilized to exhaust the contaminated lab air. It can now be operated on a VFD for partial load conditions. This saves energy as we no longer need to utilize bypass air during partial load conditions to maintain plume height. 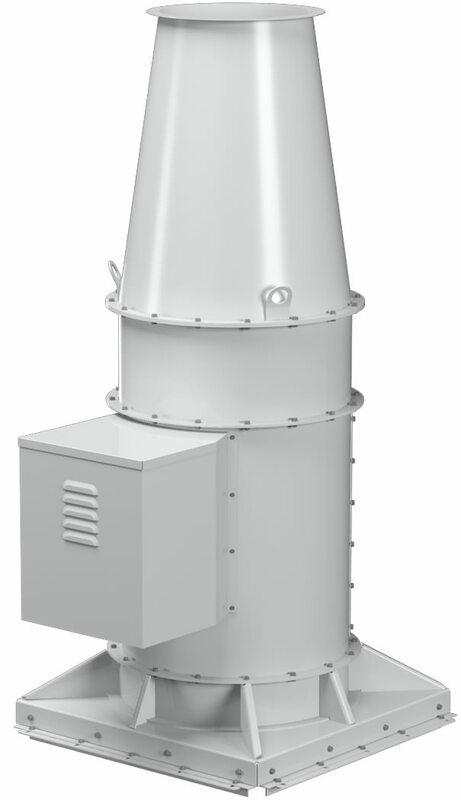 Since the primary lab exhaust fan is not required to generate the high discharge velocities for adequate plume height, the power requirements of this fan are significantly reduced. LOREN COOK COMPANY certifies that the TCNHBLE shown herein is licensed to bear the AMCA Seal. The ratings shown are based on tests and procedures performed in accordance with AMCA Publication 211 and AMCA Publication 311 and comply with the requirements of the AMCA Certified Ratings Program. Type TCNHBLE is furnished standard with UL 705 and cUL 705 listings (Power Ventilator/ZACT). All sections, drawings plans, specifications and contract documents. AMCA Standard 210-99, "Laboratory Methods of Testing Fans for Aerodynamic Performance Rating"
AMCA Standard 211-05, "Certified Ratings Program- Product Rating Manual for Fan Air Performance"
AMCA Standard 300-96, "Reverberant Room Method for Sound Testing of Fans"
AMCA Publication 311-05, "Certified Ratings Program – Product Rating Manual for Fan Sound Performance"
AMCA 204-96, "Balance Quality and Vibration Levels for Fans"
AMCA 500-D-98, "Laboratory Methods of Testing Dampers for Rating"
AMCA 500-L-99, "Laboratory Methods of Testing Louvers for Rating"
ANSI/ABMA 11-1990 (R1999), "Load Ratings and Fatigue Life for Roller Bearings"
ASTM B117-03, "Standard Practice for Operating Salt Spray (Fog) Apparatus"
ASTM D2247-02, "Standard Practice for Testing Water Resistance of Coatings in 100% Relative Humidity"
ASTM D2794-93(2004), "Standard Test Method for Resistance of Organic Coatings to the Effects of Rapid Deformation (Impact)"
Performance ratings: Fans shall be licensed to bear the AMCA Certified Ratings Seal for Sound and Air Performance. Acceptable manufacturers whose equipment is not licensed to bear the AMCA Certified Ratings Seal for Sound and Air Performance shall submit sound and air performance data obtained and calculated in accordance with AMCA Standards 210, 211, 300, and 311. These tests shall be performed by a laboratory that is accredited by AMCA. Fans shall be manufactured at an ISO 9001 Certified facility. Units specified as Spark Resistant Construction shall conform to AMCA Standard 99-0401-86, "Classifications for Spark Resistant Construction." Fan impeller shall be statically and dynamically balanced in accordance with AMCA Standard 204-96, "Balance Quality and Vibration Levels for Fans." Vibration tests shall be conducted and recorded on each assembled fan before shipment at the specified fan RPM. These readings shall conform to the AMCA 204-96 Standard. Fan manufacturer shall provide at the owner and engineer's expense and option, witness testing of the fan in an AMCA Accredited Laboratory during the submittal stage of the project. These tests shall be performed in accordance with AMCA Standard 210-99, "Laboratory Methods of Testing Fans for Aerodynamic Performance Rating." Provide dimensional drawings, product data and performance on each high-plume dilution laboratory exhaust fan unit. Provide fan curves for each fan at the specified point of operation. Airflow, static pressure and brake horsepower shall be clearly shown on the submittal. Fan curves submitted for review not utilizing a "one to one" (same scale for horizontal and vertical axis) scale shall be rejected. For multiple fan assemblies, fan curves shall also be adjusted to show assembly operation. Primary airflow from laboratory exhaust system, optional bypass airflow through mixing box, overall airflow through fan, and discharge nozzle airflow shall be provided. Outlet nozzle velocity and plume rise calculated per ASHRAE Applications Handbook shall also be provided for the specified fan performance and wind velocity. Fans selected shall allow for +/- 15% variation of scheduled static pressure and airflow. Fan shall be AMCA Arrangement 9, Belt Drive, Upblast Inline Centrifugal Blower as dictated on the plans and specifications. Fan systems shall incorporate integral lifting lugs for ease of installation. Fan housing shall be a minimum 12 gauge steel construction. Adjustable motor plate, where applicable shall utilize threaded studs for positive belt tensioning. Fan shall be constructed with an integral housing drain to alleviate rainwater. Fan shall contain a bolted and gasketed access door. Access door shall allow for the removal of wheel, shaft and bearings without the removal of the fan from the laboratory exhaust system. Belt driven fan shafts shall be stainless steel and accurately turned, ground and polished. Shafting shall be sized for a critical speed of at least 125% of maximum fan RPM. Unit fasteners exposed to corrosive airstream shall be of stainless steel construction. Option1 Unit components fabricated of steel shall be coated with an electrostatically applied, high performance, baked phenolic epoxy powder coating with an ultraviolet protective topcoat. Finish color shall be light gray. Coating thickness shall be 5.0 mils. Option2 Unit components fabricated of steel shall be coated with an electrostatically applied, baked epoxy powder coating with an ultraviolet protective topcoat. Finish color shall be dark gray. Coating thickness shall be 5.0 mils. Option3 Unit components fabricated of steel shall be coated with an electrostatically applied, baked polyester powder coating. Finish color shall be gray. Coating thickness shall be 2.0 mils. Coating shall be salt spray tested per ASTM B117 for in excess of 1000 hours without failure, humidity resistance tested per ASTM D2247 for in excess of 1000 hours without failure, and impact resistance tested per ASTM D2794 and shall pass a minimum of 100 in-lbs. Unit shall bear an engraved aluminum nameplate. Nameplate shall indicate design CFM, static pressure, and maximum fan RPM. Units specified as Spark Resistant Construction shall be constructed to the AMCA Spark Resistant Construction level as dictated on the plans and specifications. Unit shall be shipped in ISTA Certified Transit Tested Packaging. Fans shall incorporate a conical discharge nozzle supplied by the fan manufacturer. Discharge nozzle shall be constructed and designed to efficiently handle up to 6000 feet per minute outlet velocity. Nozzle shall not utilize a stack cap nor hinged cover and shall be matched to project specific requirements as noted on the contract drawings. Fan impeller shall be non-overloading, steel centrifugal, backward inclined, flatblade type. Blades shall be continuously welded to the backplate and deep spun inlet wheel shroud. Fan impeller hub shall be keyed and securely attached to the fan shaft. Fan impeller shall be statically and dynamically balanced in accordance with AMCA Standard 204-96, "Balance Quality and Vibration Levels for Fans." Fan impeller shall be coated with a finish to match the fan housing. Fan impeller shall be balanced utilizing weights which are welded and coated with chemical resistant coating. Balancing by means of bolts and washers shall not be acceptable. Belt driven fan bearings shall be designed and tested specifically for use in air handling applications. Construction shall be heavy duty regreaseable ball or roller type in a cast iron pillow block housing utilizing concentric mounting locking collars. Option1 Belt driven fan bearings shall be selected for a minimum L50 life of not less than 200,000 hours. Option2 Belt driven fan bearings shall be selected for a minimum L10 life of not less than 200,000 hours. Belt driven fan units shall have stainless steel lube lines installed from the fan bearings with Zerk fittings to allow for easy lubrication. 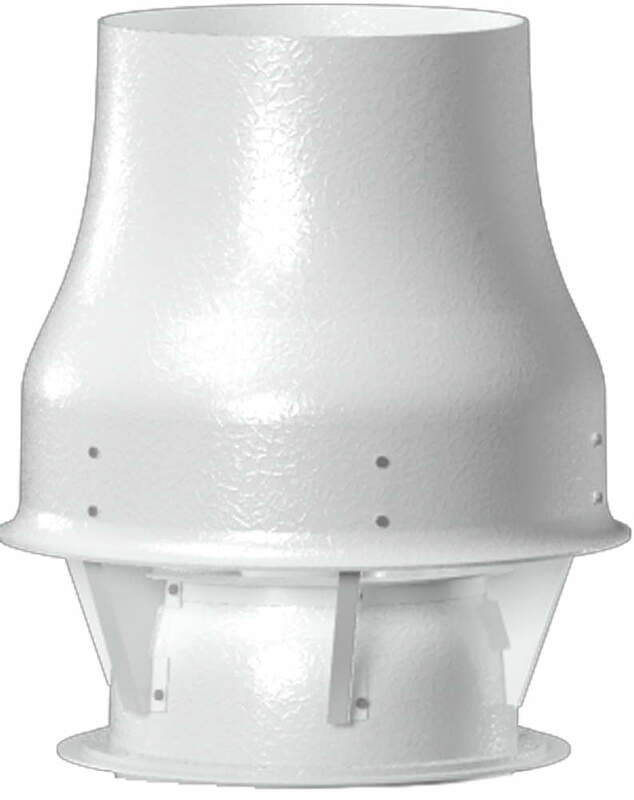 For constant volume systems the fan and nozzle assembly shall be directly connected to the roof curb and exhaust duct. For variable volume systems a bypass air plenum shall be supplied as shown on the contract drawings. Bypass air plenum shall be designed to support fan assembly (assemblies) and configuration(s) as shown on the contract drawings. Bypass air plenum shall introduce outside air above the roof level and shall have rain hood(s) and bird screen protection over the bypass air damper(s). Bypass air plenum shall be constructed of welded steel, minimum 14 gauge, with a finish to match the fan housing. Bypass dampers shall be opposed blade low leakage design. The dampers shall be aluminum construction and coated to match the fan housing. Option1 Extended shafts and manual locking quadrant handles shall be provided for adjustment of the dampers. The extended shaft can be used for external connection to actuators by controls contractor. Option2 24V electric actuators shall be provided to control the dampers. The actuators shall be provided by the fan manufacturer. Fan isolation dampers shall be provided as shown on the project documents. Option1 Isolation dampers shall be gravity type coated to match fan housing. Option2 Isolation dampers shall be opposed blade low leakage design. The dampers shall be aluminum construction and coated to match the fan housing. 2-position, spring return actuators shall be provided. The actuator shall be pre-wired with appropriate transformer to the fan disconnect switch to open when the fan is energized and close via spring return when the fan is de-energized. Option1 Fan motors shall be premium efficiency, NEMA frame, nominal 1800 or 3600 RPM Totally Enclosed Fan Cooled (TEFC) with a 1.15 service factor. Option2 Fan motors shall be premium efficiency, NEMA frame, nominal 1800 or 3600 RPM Totally Enclosed Fan Cooled, Inverter Duty Labeled with a 1.15 service factor. Option3 Fan motors shall be premium efficiency, NEMA frame, nominal 1800 or 3600 RPM Mill and Chem duty with a 1.15 service factor. Option4 Fan motors shall be premium efficiency, NEMA frame, nominal 1800 or 3600 RPM Explosion Proof with 1.0 service factor. Class ___ and Division ___ Rating. Option1 Belt driven fan drive belts shall be oil and heat resistant, static conducting. Fixed drives shall be sized for a minimum 1.5 service factor (150% of the motor horsepower) and shall be readily and easily accessible for service, if required. Option2 Belt driven fan drive belts shall be oil and heat resistant, static conducting. Fixed drives shall be sized for a minimum 2.0 service factor (200% of the motor horsepower) and shall be readily and easily accessible for service, if required. Belt driven fans shall utilize precision machined cast iron type sheaves, keyed and securely attached to the wheel and motor shafts. Install high plume fan system(s) as indicated on the contract drawings and in the contract specifications. Install fan system(s) in accordance with manufacturers Installation, Operation, and Maintenance Manuals. Start up procedures from the IOM manuals shall be strictly followed. Type QMXVP and QMXHPVP are furnished standard with UL 705 and cUL 705 listings (Power Ventilator/ZACT). Fan entrainment design shall have been verified by computational fluid dynamics (CFD). Computational fluid dynamics (CFD) evaluation of fan discharge and entrainment airflow may also be provided as requested by the owner and/or engineer. Fan manufacturer shall provide at the owner and/or engineer's expense and option, witness testing of the fan in an AMCA Accredited Laboratory during the submittal stage of the project. These tests shall be performed in accordance with AMCA Standard 210-99, "Laboratory Methods of Testing Fans for Aerodynamic Performance Rating." 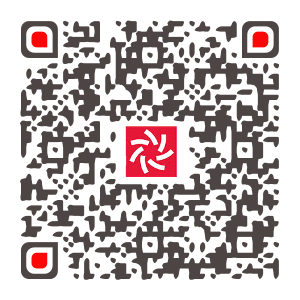 Provide dimensional drawings, product data and performance on each induced flow exhaust fan unit. Provide fan curves for each fan at the specified point of operation. Airflow, static pressure and brake horsepower shall be clearly shown on the submittal. For multiple fan assemblies, fan curves shall be adjusted to show assembly operation. Fan shall be AMCA Arrangement 9, Belt Drive, Upblast Mixed Flow as dictated on the plans and specifications. Fan housing shall be a minimum 14 gauge steel construction. Fan shall include a bolted and gasketed access door. Belt driven fan shafts shall be stainless steel and accurately turned, ground, and polished. Shafting shall be sized for a critical speed of at least 125% of maximum fan RPM. Option 1: Unit components fabricated of steel shall be coated with an electrostatically applied, high performance, baked phenolic epoxy powder coating with an ultraviolet protective topcoat. Finish color shall be light gray. Coating thickness shall be 5.0 mils. Option 2: Unit components fabricated of steel shall be coated with an electrostatically applied, baked epoxy powder coating with an ultraviolet protective topcoat. Finish color shall be dark gray. Coating thickness shall be 5.0 mils. Option 3: Unit components fabricated of steel shall be coated with an electrostatically applied, baked polyester powder coating. Finish color shall be gray. Coating thickness shall be 2.0 mils. 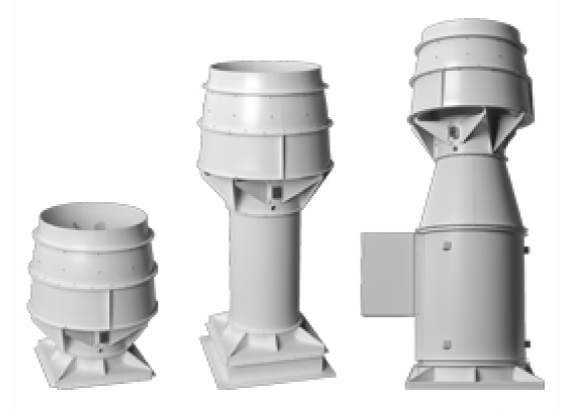 Fans shall incorporate a double concentric accelerator fiberglass reinforced plastic (FRP) induction nozzle selected for optimal performance per the plans and specifications. Nozzle shall be constructed and designed to avoid extreme variations in velocity flows across the outlet, even against wind loading. Where required, CFD shall be provided demonstrating this on submitted nozzle. Bifurcated designs shall not be allowed. Induction nozzle shall be constructed and designed to efficiently handle up to 7000 feet per minute outlet velocity and shall have a optimally matched accelerator for the specified design conditions. Fan impeller shall be non-overloading, high efficiency mixed-flow type. Blades shall be contoured single thickness blades incorporating 3-D curvature for maximum efficiency across the entire surface of the blade or airfoil type and shall be continuously welded to the backplate and inlet shroud. Option 1: Belt driven fan bearings shall be selected for a minimum L50 life of not less than 200,000 hours. Option 2: Belt driven fan bearings shall be selected for a minimum L10 life of not less than 200,000 hours. Bypass dampers shall be opposed blade design, coated to match the fan housing and plenum. A fan isolation damper gravity type coated to match fan housing and plenum shall be provided as show on the project documents. Option 1: Fan motors shall be premium efficiency, NEMA frame, nominal 1800 or 3600 RPM Totally Enclosed Fan Cooled (TEFC) with a 1.15 service factor. Option 2: Fan motors shall be premium efficiency, NEMA frame, nominal 1800 or 3600 RPM Totally Enclosed Fan Cooled, Inverter Duty Labeled with a 1.15 service factor. Option 3: Fan motors shall be premium efficiency, NEMA frame, nominal 1800 or 3600 RPM Mill and Chem duty with a 1.15 service factor. Option 4: Fan motors shall be premium efficiency, NEMA frame, nominal 1800 or 3600 RPM Explosion Proof with 1.0 service factor. Class ___ and Division ___ Rating. Option 1: Belt driven fan drive belts shall be oil and heat resistant, static conducting. Fixed drives shall be sized for a minimum 1.5 service factor (150% of the motor horsepower) and shall be readily and easily accessible for service, if required. Option 2: Belt driven fan drive belts shall be oil and heat resistant, static conducting. Fixed drives shall be sized for a minimum 2.0 service factor (200% of the motor horsepower) and shall be readily and easily accessible for service, if required. Install high plume dilution fan system(s) as indicated on the contract drawings and in the contract specifications. 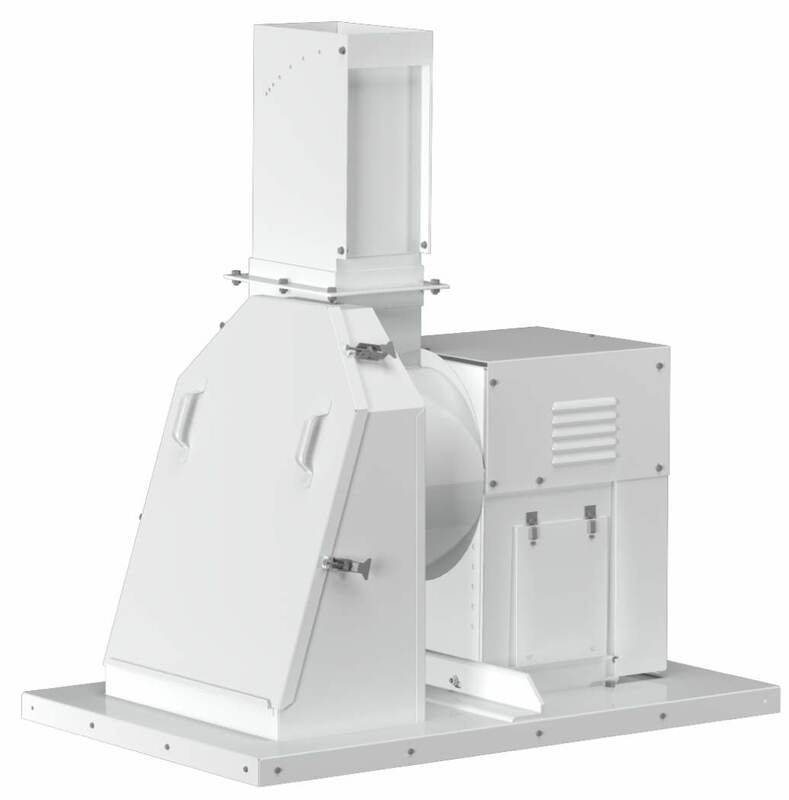 A. LOREN COOK COMPANY, Vari-Plume™ Induced Flow Exhaust Fan, Model QMXVP or QMXHPVP. requirements of the AMCA Certified Ratings Program. Type CAVP is furnished standard with UL 705 and cUL 705 listings (Power Ventilator/ ZACT). Option 1: Fan shall be AMCA Arrangement 10, Belt Drive Upblast Centrifugal Airfoil Blower as dictated on the plans and specifications. Option 2: Fan shall be AMCA Arrangement 9, Belt Drive Upblast Centrifugal Airfoil Blower as dictated on the plans and specifications. Option 3: Fan shall be AMCA Arrangement 4, Direct Drive Upblast Centrifugal Airfoil Blower as dictated on the plans and specifications. Option 4: Fan shall be AMCA Arrangement 8, Direct Drive Upblast Centrifugal Airflow Blower as dictated on the plans and specifications. Belt driven fan shafts shall be AISI C-1045 hot rolled or stainless steel and accurately turned, ground, and polished. Shafting shall be sized for a critical speed of at least 125% of maximum fan RPM. Fan impeller shall be steel, non-overloading, centrifugal backward inclined, airfoil type. Blades shall be continuously welded to the backplate and inlet shroud. Fan impeller hub shall be keyed and securely attached to the fan shaft. Fan shaft shall be AISI C-1045 hot rolled or stainless steel and accurately turned, ground, and polished. Shafting shall be sized for a critical speed of at least 125% of maximum fan RPM. Fan impeller shall be coated with finish to match the fan housing. Option 1: Belt driven fan bearings shall be designed and tested specifically for use in air handling applications. Construction shall be heavy duty regreaseable ball or roller type in cast iron pillow block housing. Option 2: Pillow block bearings shall utilize concentric mounting locking collars for attachment to fan shaft. Option 1: Belt driven fan bearings shall have copper lubrication lines run to a centralized location for ease of maintenance. Option 2: Belt driven fan bearings shall have stainless steel lubrication lines run to a centralized location for ease of maintenance. LOREN COOK COMPANY, Vari-Plume™ Induced Flow Exhaust Fan, Model CA-VP. 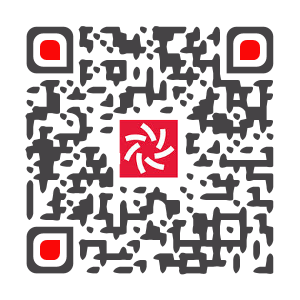 LOREN COOK COMPANY certifies that the Power-Plume shown herein is licensed to bear the AMCA Seal. The ratings shown are based on tests and procedures performed in accordance with AMCA Publication 211 and AMCA Publication 311 and comply with the requirements of the AMCA Certified Ratings Program. Type Power-Plumeis furnished standard with UL 705 and cUL 705 listings (Power Ventilator/ZACT). AMCA Standard 210-07, "Laboratory Methods of Testing Fans for Aerodynamic Performance Rating"
AMCA Standard 300-08, "Reverberant Room Method for Sound Testing of Fans"
AMCA 204-05, "Balance Quality and Vibration Levels for Fans"
Performance ratings: Fans shall be licensed to bear the AMCA Certified Ratings Seal for Sound and Air Performance. Acceptable manufacturers whose equipment is not licensed to bear the AMCA Certified Ratings Seal for Sound and Air Performance shall submit sound and air performance data obtained and calculated in accordance with AMCA Standards 210, 211, 300, and 311. These tests shall be performed by a laboratory that is accredited by AMCA and certified by an officer of the manufacturer's company. Fan impeller shall be statically and dynamically balanced in accordance with AMCA Standard 204-05, "Balance Quality and Vibration Levels for Fans." Vibration tests shall be conducted and recorded on each assembled fan before shipment at the specified fan RPM. These readings shall conform to the AMCA 204-05 Standard. Fan manufacturer shall provide at the owner and/or engineer's expense and option, witness testing of the fan in an AMCA Accredited Laboratory during the submittal stage of the project. These tests shall be performed in accordance with AMCA Standard 210-07, "Laboratory Methods of Testing Fans for Aerodynamic Performance Rating" and AMCA Standard 300-08, "Reverberant Room Method for Sound Testing of Fans." Provide dimensional drawings, product data and performance on each powered dilution exhaust fan system. Primary airflow from laboratory exhaust system, outlet airflow through fan, and discharge nozzle velocity shall be provided. Plume rise calculated per ASHRAE Applications Handbook shall also be provided for the specified fan performance and wind velocity. Provide fan curves for each powered dilution exhaust fan system at the specified point of operation. Primary and outlet airflow, and brake horsepower shall be clearly shown on the submittal(s). For multiple fan assemblies, fan curves shall be adjusted to show assembly operation. Powered Dilution Exhaust Fan shall be a powered induction device which can maintain a minimum plume height and minimum dilution ratio under reduced lab exhaust flow conditions without the use of bypass air. Reduced lab exhaust flow is accomplished by reducing the speed of the primary lab exhaust fan. Powered Dilution Exhaust Fan shall be AMCA Arrangement 4, Direct Driven, Upblast as dictated on the plans and specifications. Powered Dilution Exhaust Fan system(s) shall incorporate integral lifting lugs for ease of installation. 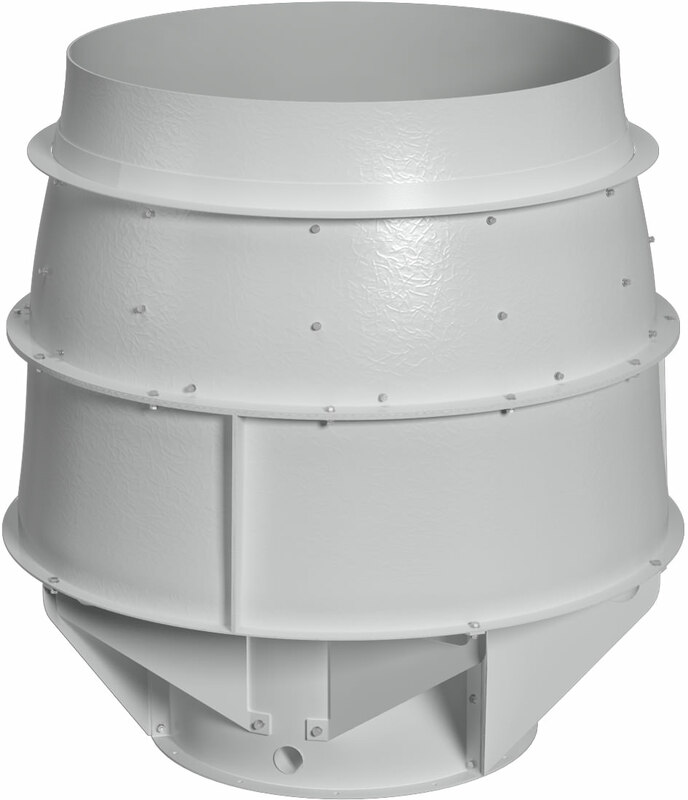 Powered Dilution Exhaust Fan wind band shall be fiberglass reinforced plastic (FRP). Unit components fabricated of steel or aluminum shall be coated with an electrostatically applied, high performance, baked phenolic epoxy powder coating with an ultraviolet protective topcoat. Finish color shall be light gray. Coating thickness shall be 5.0 mils. Unit shall bear an engraved aluminum nameplate. Nameplate shall indicate design primary and outlet CFM, motor horsepower, and maximum fan RPM. Install Powered Dilution Exhaust Fan system(s) as indicated on the contract drawings and in the contract specifications. LOREN COOK COMPANY, Power Plume® Powered Dilution Exhaust Fan.